Tonight’s gig was one I’d been looking forward to since I first listened to the album ‘Seesaw’ by Joe Bonamassa and Beth Hart earlier this year. The duo are only playing a handful of shows together in Europe, and with the London date sold out, a trip to Antwerp was called for. The venue was a pretty large one – I’m guessing around 6000 people and it was almost completely full, which is a pretty good turnout for a midweek gig. I did get one shock before the band came on stage – there was no merchandise stand. An arena gig where they aren’t trying to sell T-shirts, CD’s or anything else? I’d never seen that before. The first thing that struck me when the band came on stage was that I’d expected Beth Hart and Joe Bonamassa to be at the front of the stage, but in reality the front half of the stage was used by Beth Hart, while Joe Bonamassa was with the other guitarist, the bassist and the keyboard player at the back of the stage. Over to one side of the stage were three more musicians playing percussion and brass instruments. Right from the start I was blown away. They kicked off with ‘Them there eyes’ from the Seesaw album. The brass instruments give it a really punchy sound, and it works really well as an opening song. On her albums Beth’s voice sounds fantastic, but tonight it seems even better – perhaps her decision to quit smoking has helped? Whatever the reason she sounds simply fantastic tonight, and is clearly having a great time – she can barely stand still and spends most of the show either dancing, strutting around the stage, laughing and joking with the band members and generally enjoying herself while putting in a superb vocal performance. Tonight we get a set based primarily around the two albums that Beth and Joe have recorded together (‘Don’t explain’ and ‘seesaw’), with a couple of other songs also included. During ‘Somethings got a hold on me’ Beth sat on the edge of the stage before jumping down and dancing down the aisle to the back of the venue and back up the other aisle. Judging by the panicked reaction from the crew and security, this clearly wasn’t something that was planned – just something spontaneous. Certainly she seemed to be having a great time and it served to get the crowd up on their feet (it was an all-seated gig) with many of them dancing too. For ‘Chocolate Jesus’ the crew brought out a keyboard for Beth to sit down and play (she joked that as she’s not in her 20s anymore then she needs to sit down more often), and she continued to play keyboards during the next song too, one of her solo songs, ‘Baddest blues’. For the next song, ‘Someday after a while’, Beth left the stage and Joe Bonamassa took over vocal duties. From my position to the side of the stage I could see that while Beth was in a dark off-stage area out of sight of 99% of the crowd, she was still dancing away to the music – it just shows that she isn’t putting on an act on stage, she really does love the music and seems to find it impossible to just stand there and either sing or listen but instead feels the need to dance, move around and generally release all that energy she has. On stage Joe put in a great performance, both vocally and on guitar. Beth then rejoined the stage for the rest of the set. 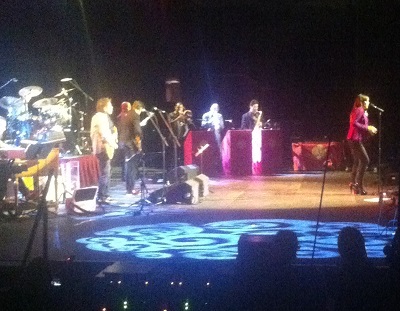 The band end with ‘Miss lady’ before leaving the stage before the huge applause brings them back out to do an encore. They kicked off the encore with ‘I love you more than you’ll ever know’ which was notable for the fact that for the first time, Joe ventured forward to the front of the stage for his superb guitar solo. Next up was their superb version of the Ike and Tina Turner classic, ‘Nutbush city limits’ which had the whole place going crazy – a fantastic end to the night…. except it wasn’t. They left the stage before coming back out for a second encore – I’d rather go blind. I have to say that while the second encore was great, I think it would have worked better with ‘Nutbush city limits’ as the last song of the night – in terms of the crowd reaction there’s just nothing else they played that can top that one. Tonight, we got around 100 minutes of superb music – the whole band are top class, and Joe Bonamassa had plenty of fairly short guitar solos during the night, but it’s not often that world class guitar playing like we saw from Joe tonight can be overshadowed, but with a voice as special as Beth Hart’s, that’s exactly what happened. I think that’s down to a combination of two factors – firstly Joe Bonamassa was happy to just be part of the band and to largely avoid the spotlight, and secondly Beth Hart has a truly exceptional voice. They clearly appreciate each other and also the other musicians they’re playing with, and at several points during the show Beth comments about how good Joe’s guitar playing is, or about how she was introduced to the songs of a certain artist by either Joe or by their producer Kevin Shirley. Tonight’s set covered a range of songs, from real soulful blues, such as ‘Strange fruit’ to uptempo songs like ‘Them there eyes’ and the rock of ‘Nutbush city limits’. This really was a great night – superb guitar playing and superb vocals, from some of the best talents in the world – that makes this a gig that it’s going to be very hard to beat. It was definitely worth the travelling. I really hope the pair manage to find time in their schedules to do more dates together – if they do then I definitely recommend that you try and get to one of them.